The rugged shore of the Central and Northern Oregon Coast is backed by the Coast Range Mountains, remnants of a chain of volcanic islands that collided with the North American continent some 50 million years ago. The Oregon Coast is notable for its basalt headlands, such as Cape Foulweather and Cape Perpetua, and for a succession of bays, estuaries, and river mouths. Volcanic cliffs alternate with beaches ringed by eroded sandstone and mudstone. Offshore are basalt seastacks, once a part of the mainland. The Central Oregon Coast extends from Cascade Head on the north, to Florence at the south. The land and sea have provided plentiful resources here for human societies for thousands of years. Since time immemorial, Indian tribes and bands stretched along the coast: Salmon River, Siletz, Yaquina, Alsea, Siuslaw, Lower Umpqua, and Coos. The tribal names remain prominently applied to the rivers and estuaries. and were linked by trade and intermarriage. Although coastal tribes and bands were distinguished by cultural and linguistic differences, they interacted and traded with each other. Cedar canoes traversed the rivers and estuaries, and a network of trails reached across the Coast Range Mountains and threaded the coastline. Euro-Americans on the isolated Oregon Central Coast. 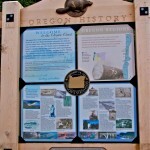 Then, gold discoveries brought miners and traders to Coos Bay and the Umpqua River regions. Throughout the new Oregon Territory, the federal government attempted to acquire title to Indian lands. On the Oregon Central Coast, most tribes reluctantly signed treaties that would have ceded their lands, but the US Senate failed to ratify them. The Coast Reservation was established in 1855, stretching about 100 miles along the coastline. The indigenous people were joined by many Indians who were forcibly marched there from Southern Oregon after the end of the Rogue River Wars in 1856. Indians on the reservation were directed to take up farming, a futile endeavor in the coastal forests. Starvation, abuse, and disease took a terrific toll. The Coast Reservation was reduced in size in 1865 and again in 1875. Euro-American settlers soon came to the Oregon Central Coast in pursuit of its natural resources. They established lumber mills, salmon canneries, and oyster beds in the coastal estuaries. 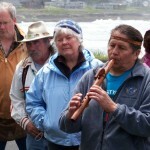 Coos and Lower Umpqua people returned to the Siuslaw River, no longer reservation land, while some Alsea went north to the Siletz Reservation. By the 1880s, small sailing schooners and steamships linked the Central Coast with Portland and San Francisco, often confronting fierce storms and dangerous headlands. The federal government improved navigation by establishing lifesaving stations, jetties and lighthouses. The first Umpqua River Lighthouse was completed in 1857. During the 1890s, Indians acquired individual allotment lands and tried to farm, as did some white homesteaders. Most Central Coast residents relied on small-scale fishing and lumbering operations for their livelihood. When the first railroad reached Yaquina Bay in 1884, it opened new markets; a second railroad reached Coos Bay in 1916. The rapid growth of automobile ownership pushed road construction in the 1920s. Local highway segments were finally connected into a border-to-border Oregon Coast Highway during the 1930s. Bridges replaced ferry crossings at Yaquina Bay, Alsea Bay, the Siuslaw River, and the Umpqua River. The last ferry was retired in 1936 with the completion of the Condé B. McCullough Bridge over Coos Bay. 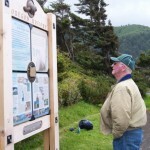 The Oregon Coast Highway fostered tourism on the Central Coast, adding a new economic footing to the earlier bases of fishing and logging. Efforts to terminate federal-Indian tribal relationships in the 1950s failed but eventually led to renewed tribal vigor. In 1977, the Confederated Tribes of Siletz Indians once again received federal recognition, and the sovereignty of the Confederated Tribes of the Coos, Lower Umpqua, and Siuslaw Indians was recognized in 1984. The homelands of the Indians are now shared with other Oregonians.